The company licensed its trademark alien for the weapons while it was owned by Condé Nast, a Mother Jones investigation shows. Since 2011, part of the popular online forum Reddit has grown into an active marketplace for assault rifles, high-capacity magazines, and other powerful firearms, according to an investigation by Mother Jones. In the last six months alone there have been more than 1,000 listings posted by more than 400 Redditors on the GunsForSale subreddit, one of thousands of niche communities on the sprawling discussion site. Not only has Reddit allowed a gun market to thrive, it has also literally put its stamp on it: Gun purchases brokered through the site have included nearly 100 AR-15s engraved with Reddit’s alien logo, which was used on the assault rifles with explicit permission from the company—while it was owned by media giant Condé Nast—according to email correspondence obtained by Mother Jones. “I know dealers that operate exclusively without doing any background checks,” said one Redditor. The Reddit-branded AR-15s represent just a sampling of the powerful firearms purchased through the site, which has tens of millions of users and often drives major traffic to other websites. Many listings have offered guns in quantity: In September, for example, an active seller and Redditor who goes by the handle “FirearmConcierge” advertised an inventory of black SCAR 16s, a combat assault rifle made for US Special Operations forces. “UPS freight just dropped 19 of them off,” the listing read, pricing them at $2,300 a piece. According to his online postings, FirearmConcierge is a federally licensed firearms dealer (FFL) operating in Florida. Instructions posted by the moderators of the GunsForSale subreddit warn users to comply with federal and state laws, and many sellers on the site say that they transfer guns through FFLs, which conduct background checks on buyers. But some user comments suggest that sellers may be exploiting a loophole in federal law to traffic firearms—including talk of licensed dealers selling guns without conducting background checks, which in some circumstances would be illegal. At least 159 transactions have been completed on GunsForSale since last June, according to more than 100 Redditors who reported them using the subreddit’s automated system for verifying sales and rating sellers. The number of completed transactions may be higher, because some deals arranged through private messaging on the site and completed face-to-face likely go unreported. Reddit does not know, however, if the gun sales done through its site are done legally: The company does not track commercial transactions between its users, according to Taylor. Personal privacy is prized among Redditors, most of whom participate on the site anonymously. A fervent pro-gun constituency among them makes the market opportunity for gun dealers all the more attractive. The primary subreddit on the topic, /r/Guns, currently has more than 154,000 subscribers, and GunsForSale, created in March 2011, has doubled in size in the last year, with more than 7,200 subscribers. Gun dealers using the site indicate that they’ve enjoyed a spike in demand in the past year, after the Sandy Hook massacre ignited a national debate and pro-gun activists whipped up fears about a regulatory crackdown. From July through mid-December, FirearmConcierge posted 268 listings on the GunsForSale subreddit, offering hundreds of assault rifles and related components, hundreds of ammunition magazines containing 30 or more rounds, and hundreds of handguns, silencers, flash suppressors, and other weaponry. Data on gun listings and transactions was provided by a Redditor who goes by the name “Townsley” and moderates a subreddit, GunsAreCool, whose contributors criticize pro-gun Redditors and advocate for stricter gun regulations. Mother Jones independently verified and analyzed the data, and conducted additional research into gun-related activity on Reddit. Lax regulations in many states encourage that preference. North Carolina, for example—where Redditor “mhuxtable” advertised an AK-47 for sale in August—has no law restricting assault weapons nor does it require a license or a background check to own semi-automatic rifles. In theory, a federally licensed dealer could sell a firearm from his personal collection without conducting a background check, just like any other private citizen subject to state law, says David Chipman, who served for 25 years as a special agent in the Bureau of Alcohol, Tobacco, Firearms, and Explosives. But it would be illegal, Chipman warns, for a licensed dealer to sell any guns from his business inventory without a background check. Gun sales on the internet have boomed in recent years, with tens of thousands of firearms listed on sites like GunBroker and Armslist; by some estimates, 40 percent of all gun sales in the United States now take place without background checks. But many of the largest US websites have banned gun dealing, including Google, Amazon, Craigslist, and eBay. The user agreement for Reddit states that “Reddit is not intended to be a marketplace for any goods or services.” Yet, its users are allowed to engage in private commercial activity, according to Taylor, the communications director. The language in the user agreement, she said, refers to the fact that Reddit itself does not provide marketplace services, such as guaranteeing adequate payment or delivery of products. A group of about 35 (or so) members of the sub Reddit /r/guns <http://reddit.com/r/guns> want to engrave your alien logo in a lower receiver. We do not plan to sell the product and the vendor is not making a profit on the engraving or the lowers themselves. We are doing this as a group buy to save money. What would the licensing cost be to uses [sic] this for personal non-profit uses? A lower receiver is the frame of an AR-15. 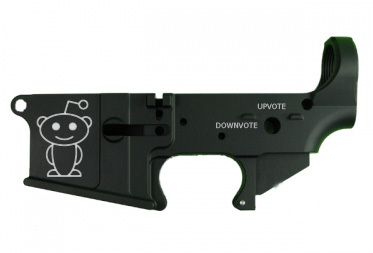 You have reddit’s permission to engrave the reddit alien on the frame of the AR-15 given that it is a group not-for-profit buy. There is a lot of reservation on our team about the language on the safety. We would prefer that you keep the SAFE/FIRE language (rather than changing to downvote/upvote) to ensure the safety of all people who may come in contact with these guns. Donlin did not respond to inquiries from Mother Jones, including questions about who else participated in the licensing decision. Condé Nast purchased Reddit in 2006. In September 2011—four months after the logo was licensed for the assault rifles—Reddit was moved out from under Condé Nast and made a division of Advance Publications, Condé Nast’s parent company, with two Condé Nast executives serving on the new subsidiary’s board of directors. In 2012, Advance Publications relinquished its sole ownership of Reddit, but it remains the largest shareholder in the company. The president of Condé Nast, Bob Sauerberg, continues to serve on Reddit’s board, a Condé Nast spokesperson confirmed to Mother Jones. In fact, the license was used for three separate bulk orders of AR-15 lower receivers (the defining component of the firearm under federal law) between May 2011 and July 2012, and at least 93 of them were manufactured, according to Redditors who organized the orders and Double Diamond Law Enforcement Supply, a gun manufacturer in Arizona that produced them. Last month, two days after the anniversary of the Sandy Hook massacre, Redditors began organizing a new bulk order of the guns.